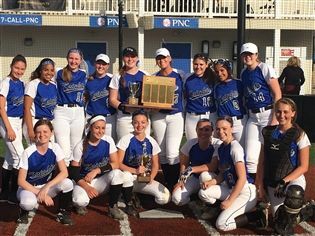 Yesterday afternoon, varsity softball defeated Morristown-Beard 9-4 to claim the Prep B Championship, marking the second consecutive year the girls have won with title. The Knights got off to an early 4-0 lead, with hits from the heart of the lineup in the first inning, including a two-run homerun off the bat of Grace Beveridge '18. Morristown-Beard narrowed the gap in the second, posting two unearned runs, but ace Emma Corbett '16 kept them scoreless in the third and fourth. In the bottom of the fourth, the Knights tacked on four more runs, including a bases-loaded, two-RBI shot from Kaitlyn Moriarty '16. Morristown-Beard threatened in the fifth, loading the bases, but Corbett and a strong defense kept them from driving in a run. The Knights closed out the game in style, with two strikeouts from Corbett and a phenomenal diving catch from Emily Supron '17 in right field. Corbett recorded her eighth win of the season and went two for three with a walk. At the plate, Maddie Bedrock '17 and Claire Chestnutt '18 were both three for four; Danny Towle '18 went three for three, and Beveridge went two for four with a homerun. Reflecting on the game, head coach Nicole Spiotta said, "I am so proud of the girls. It was a true team effort. 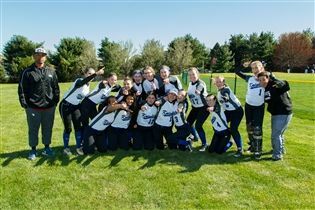 They have all worked so hard and improved tremendously over the course of the season. It was a well-deserved win." 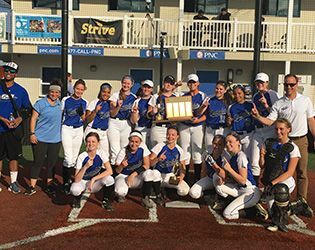 On Thursday, May 26, at home, the girls will take on Saint Joseph High School of Hammonton in the second round of the state championship. Saint Joseph's is seeded fifth and the Knights, fourth.